Warrenpoint Town's Alan O'Sullivan fired home a first half brace against Institute. Warrenpoint Town put the lights out on Institute, with a sparkling first half display, at the Q Radio Arena. A terrible first half was summed up for Institute when striker Joe McCready missed from the penalty spot and within two minutes they had conceded a third goal. Town seemed to more up for the game right from the off and in truth always looked a threat when going forward throughout the first half. The home side got off to the perfect start on four minutes when 'Stute gave possession away from a throw-in and Ciaran O'Connor broke clear down the left before seeing his cross finding Alan O'Sullivan at the near post and the striker headed home superbly. A minute later 'Stute had a good chance to level things but after breaking the offside trap, Gareth Brown's tame right footed strike from just inside the box, failed to test Town keeper Berrat Turker. Town doubled their lead on 17 minutes after a training ground routine saw Eamon Scannell's free-kick to O'Connor some 30 yards from goal, saw ex-Derry City man's clever pass find O'Sullivan inside the box, he controlled the ball down before firing home. On 27 minutes the visitors had a half chance, but Ronan WIlson's left footed strike from close range, was easily gathered by Turker. Institute missed a great chance to get back into the game on 34 minutes when Callum Moorehead was brought down inside the box by Turker, after Aaron Harkin's wonder ball had played in the winger, however Joe McCready's resulting penalty flew well wide of Turker's left hand post. 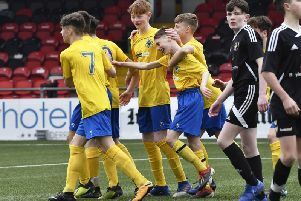 To compound Institute's misery Town added a third virtually straight away when a goal mouth scramble ended with O'Connor's header finding Lee Duffy, who gleefully side footed home past 'Stute Marty Gallagher. Stephen McDonnell's side scored a superb fourth goal on 62 minutes as a fantastic passing move ended with O'Sullivan's first time pass finding Duffy, who took a touch before firing home from the left hand angle of the penalty box. Institute brought on new signing's Paul Smyth and Tommy McBride as they went in search of a consolation goal and they should have scored on 74 minutes, but incredibly they missed a second penalty. This time substitute Jamie McIntyre was upended inside the box by fellow sub Kris Cowan, but Harkin fired well over from 12 yards and just summed up how terrible day it was for McLaughlin's men. Warrenpoint Town: Turker, Foster, Wallace, Moan, Scannell (Cowan 70); McCaffrey, Magowan (Watters 80), Donnelly, O'Connor (Lynch 60); Duffy, O'Sullivan. Institute: Gallagher, Wilson, Bonner, D Curry, Dunne (McIntyre 62); Jarvis, Harkin, Doherty; Brown (Smyth 68), McCready, Moorehead (McBride 73) .